When I moved from Iowa to Colorado in the late 70’s I missed one of my fave pies: Sour Cream Raisin Pie. Of course, back then I didn’t know it was a regional specialty, popular throughout the Midwest & areas where good, solid, Germans settled. It seemed no-one in Colorado had heard of it, and it was nowhere to be found. I was thrilled when a friend of my Mom’s gave me her family recipe. It’s about as old-fashioned as they come – she thought about 90 years and she gave it to me about 40 years ago! The method is mix and bake. 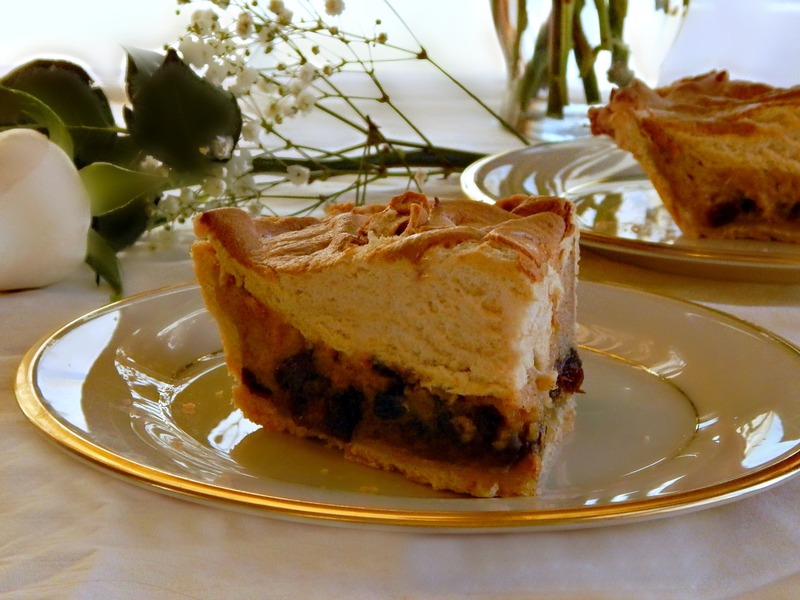 Some newer recipes s are cooked stove top first, like an old-fashioned custard and they’re wonderful and creamy, kind of like a coconut or banana cream pie except with raisins, but this, here, this is the real deal Sour Cream Raisin Pie. I hadn’t thought of it for years until my Dad said he’d love to have some Sour Cream Raisin Pie. My Stepmom pulled a face – I know, I know – it sounds strange if you’re not familiar with it! But after a few bites, she proclaimed it the “Best Pie I’ve ever eaten!” I’ll take that, thank you! I added a brown sugar meringue topping but in the Midwest most Sour Cream Raisin Pies that you get at a diner have a billowy white meringue and when I was growing up most home-baked ones didn’t have meringue at all. Maybe ’cause meringue used to be pretty tricky in the old days without great ovens, electric mixers, and air conditioning. If you want a white meringue, try the one on Cook’s Illustrated Lemon Meringue Pie – just because it is the best Meringue, evah!! I also just “had” to pair this with a very old pie crust recipe of my Grandmother’s that I think was from about the same era – I just thought it fitting. How old, you might ask? Old enough that the original recipe called for “rendered lard”. It’s quite different from the crusts I’ve made before. Preheat oven to 375 degrees. Arrange pie crust in a regular sized, not a deep dish, pie plate and flute as desired. Set aside. In order, in a large bowl, add all pie ingredients in order except raisins and mix until smooth. Stir in raisins. Pour filling into crust. Bake in the lower half of the oven until filling is set, about 40 minutes. Allow to cool to room temperature before serving. If using meringue, add as soon as the filling is firm in the center and bake about 15 – 20 minutes until golden brown. This brown sugar meringue may raise alarmingly and then fall a bit, but that is to be expected. In a small pan, add the tablespoon of cornstarch, then whisk in 1/3 cup water. Bring to a bare simmer in small saucepan and cook, whisking occasionally, until it just becomes thickened and translucent looking, 1 to 2 minutes at most. Remove from heat and let cool slightly to barely or lukewarm while the eggs are being whisked. It’s helpful to transfer to a small cup as it may continue to cook and harden in the hot pan and be difficult to incorporate into the meringue. If using stand mixer, fit it with the whisk, and beat egg whites and vanilla at medium low-speed until foamy and frothy. Mix together the cream of tartar and sugar, turn the speed up to medium high and add, a tablespoon at a time until incorporated (it won’t feel grainy when you run a bit between your fingers) and the mixture forms soft, billowy mounds. Continue to whip and add the cornstarch mixture, about a tablespoon at a time. Continue to beat until stiff, glossy peaks form, about two to three minutes longer. Working quickly, dollop meringue in small mounds across the hot pie filling. Using rubber spatula, immediately distribute meringue evenly around edge and then center of pie, attaching meringue to pie crust to prevent shrinking. Top off with any remaining meringue. Using the back of spoon, create attractive swirls and peaks in the meringue. (I personally like to use the spoon to make small “scallops” with only a very few peaks which prevents the peaks from over baking before the rest is nicely browned.) Make sure the meringue is “sealed” to the crust with no gaps. Bake until meringue is light golden brown, about 20 minutes. For more details and photos of the Meringue, see my Lemon Meringue Pie recipe. You know I’ll be bringing this to our Throwback Thursday #22 Link Party, hosted by Quinn of Dad What’s for Dinner, Meaghan of 4 Sons are Us, Alli of Tornadough, and Moi! That’s right – me! Click over to our Throwback Thursday post for links to their blogs and social media, rules and more info or just click on the blue leapfrog, below, to view all the posts or enter your own! I’ll also be linking this to Fiesta Friday number 103! FF is a link party put on by Angie, and cohosted this week by Sonal @ simplyvegetarian777 and Petra @ Food Eat Love. Stop over and join in! This entry was posted in Click here for Fabulous Food Posts and tagged Desserts, Family Recipe, German, Heritage Recipe, meringue, Pie, Raisins, Sour cream. Bookmark the permalink. “Old” cakes are always special and always taste the best! I love that there are so many regional specialties in the US. This sounds delicious and so different. You would think that everyone would know about everything now with the internet, but every now and then there’s a surprise! I think this little gem is one of them. I love old cookery books and I have a bunch of hand written recipes from my Grammy. It is a shame that that seems to be going by the wayside. Lovely recipe. I think I would have the same reaction as your stepmom! I’m sure it will look very strange! I am going to have to make this. My mom’s favorite diner was in a really small town just outside of ours. They were known for their mile high meringues. They made their own egg yolk pasta, so they used all of the whites up by piling them high on pies. Anyway, her favorite was the raisin cream pie and that place just closed. I’ll have to make her this on her birthday or something! The availability of recipes is awfully convenient, but with all the recipes out there, it’s a bit more difficult to figure out which ones are good 🙂 I love hearing about the history behind a recipe–one that’s been treasured enough to be passed from one person to another is certainly going to be wonderful! Oh my!! This is a treasure of a recipe..kinda heirloom.. Regional recipes like these are rare finds these days!! Beautiful pie there! Thanks for sharing at FF 103 :). Sonal, thank you, and thank you for hosting FF! I;ve heard of these pies before but never actually saw one until now, sounds like good simple delicious pie. Love it! I think I ran across that name in a recipe book by a Mennonite area (Kitchener-Waterloo, Ontario) cook. Looks delicious. Not fancy but GOOD! Yes, that’s the perfect description – it’s just good home cooking! I can imagine some young woman out on the Iowa prairie in the dead of winter, with the wind howling, and nothing but what’s on the farm to eat, stored staples and maybe a few raisins, serving this up. It must have been quite a treat. About four years ago, I met up with a new friend at her house for lunch, and she served sour cream raisin bars for dessert! I was so intrigued by the name of them, but very impressed with the taste! She has German roots, so this all makes sense now. Thank you for sharing the recipe!